Berbert De Melo Co. is a custom general contractor located in Walpole, Massachusetts. [Learn more]. The purpose of our Soundproof division is to bring quality and sound absorbing materials. Want the best quality interior painting service? We will listen to your needs, address your concerns and deliver a result you will love. When you are considering painting the exterior of your home you should first consult Berbert De Melo Painting Services. We are glad you are visiting our website. 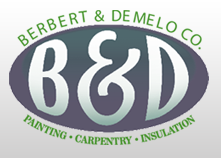 Berbert De Melo Co. is a custom general contractor located in Walpole, Massachusetts. Our mission is to deliver quality service from start to the completition of the project. We have been providing custom and specialized interior and exterior painting, carpentry and insulation services in the greater Boston area since 2001. We're a family business and our company owners are personally involved in every project. [Read more]. Come in the specific time went to work right away, had very little to say and did a good job, even very friendly. On time, On budget and neat job. plus working in freezing weather! On time, great job and total clean up. Winter will be so much warmer. We had grat service from this insulator, was on time, and informative. On time and very responsive to all questions and issues. Left job site immaculate. Person arrived on time clean, neat appearence, pleasant, professional. Thank You! Great job and very nice work crew ,very happy. Thank You! With over 10 years experience we have built a high reputation in the Boston area. You can count on our experience, reliability, quality & customer service.